Eastern redcedar is an evergreen coniferous tree native to the woodland edges, old fields, meadows, and rocky ground of eastern North America from Nova Scotia and Ontario, south to Florida and Texas. It is a member of the cypress family, Cupressaceae, that also includes arborvites and junipers and are not a true cedar. The small to medium sized tree may be conical or oval to rounded and has reddish brown bark that is scented and exfoliates in thin ragged strips. The awl-like needles are olive to deep green, darkening or yellowing in winter. Male and female cones are produced on separate trees. The female cones are blue-gray, berry-like and up to ¼ inch long while the male pollen cones are half their size. The seed cones are attractive to many birds. Eastern redcedar is a pioneer species and a tough plant that tolerates a wide variety of soil types, but not shade. It is a good choice for a hedge, windbreak, screen, and topiary but carries cedar apple rust so should not be planted near apple trees. 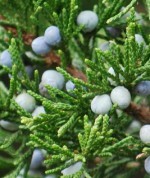 The genus name Juniperus, is the Latin name for the plant. The specific epithet virginiana is the Latinized form of Virginia and refers to a type location. Care: Low maintenance; can be pruned if desired.